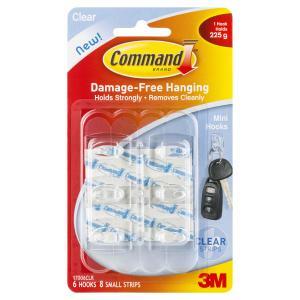 Command™ Clear Mini Hooks hold up to 225g and are great for hanging keys, calendars and other small objects. Clear design blends in with any wall surface. Removes cleanly if you change your mind. Forget about nails, screws and tacks, Command™ Clear Hooks are fast and easy to hang! The revolutionary Command™ Clear Adhesive Strip holds strongly on a variety of surfaces, including painted plasterboard, wood, tile and more. Yet, removes cleanly - no holes, marks, or sticky residue. Each pack contains 6 hooks and 8 strips. Command™ Clear hooks blend in with most wall surfaces. Cupboard keys for example often go missing. Give them a home with the Command™ Clear Mini hooks. Feel empowered to hang items in your office without damaging walls. Office kitchenettes tend to be small. Command™ Clear Utensil hooks allow you to hang larger utensils onto glass and tile splashbacks without having to drill into these surfaces. Especially handy to have utensils in easy reach, when you are busy preparing to host external visitors or during team lunches. Command™ Clear Utensil hooks are ideal for hanging a range of other items including calendars.